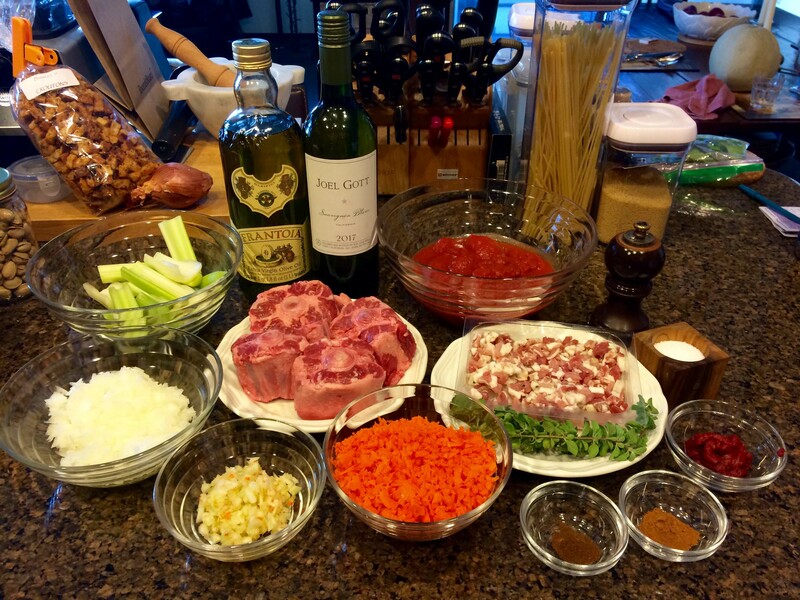 For the longest time, I’ve been wanting to make oxtails like the ones I enjoyed years ago on my first trip to Rome. 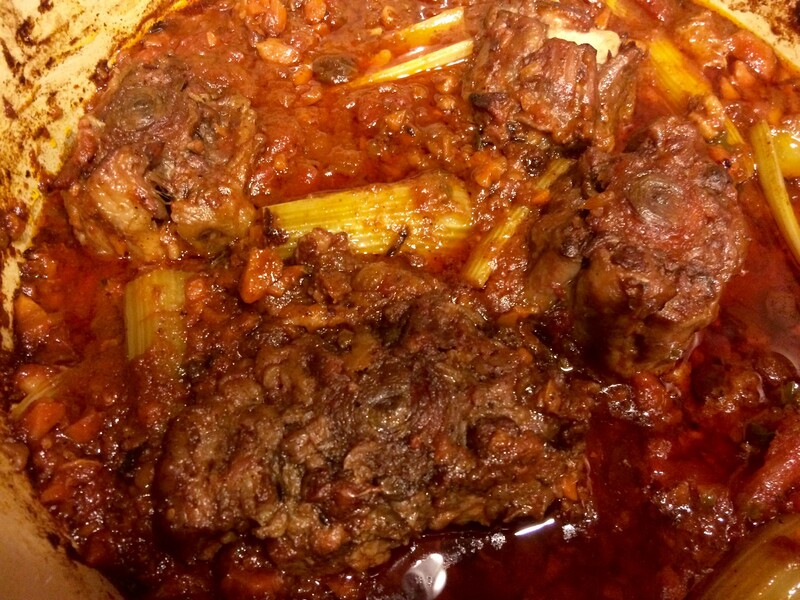 It was in that city’s Testaccio district that I had coda alla vaccinara, a dense stew of oxtails braised with vegetables, primarily celery, tomatoes, and white wine. The Testaccio was the location for Rome’s slaughterhouse from 1888 to 1975. Here the need to use every part of an animal led to the district’s reputation for offal, or in Italian, the quinto quarto, the fifth quarter. 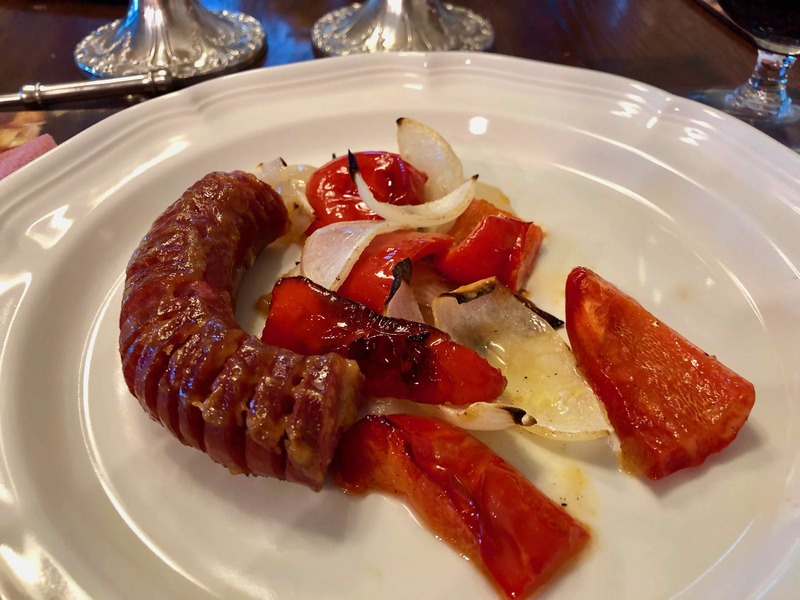 The best known dishes of the variety include pajata, veal intestines; trippa alla Romana, tripe, and the subject of today’s post coda alla vaccinara. 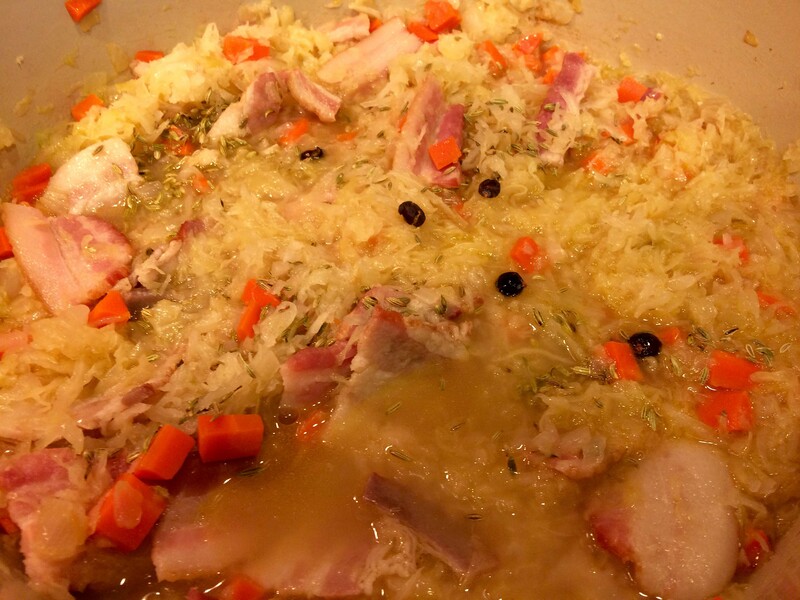 All dishes that are associated with Italy’s cucina povera, or peasant cooking. I looked through a number of cookbooks for a recipe and found some excellent ones in Oretta Zanini De Vita’s Popes, Peasants, and Shepherds (the most authentic), David Downie’s Cooking the Roman Way, and Marcella Hazan’s The Classic Italian Cookbook. Ultimately, however, I chose a recipe by Amanda Hesser in the New York Times. 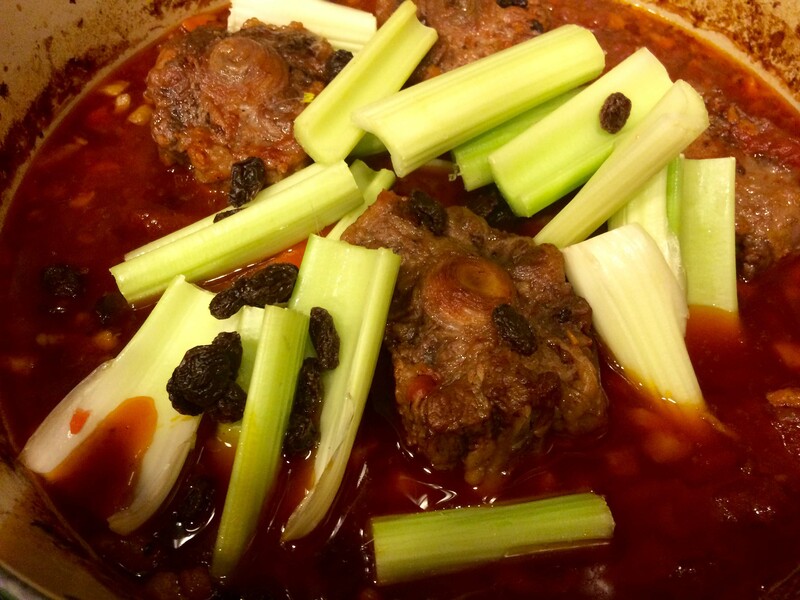 It seemed the most straightforward; though I did modify it with elements from the other recipes, for example increasing the amount of celery and onion or adding raisins during the last hour of braising. The dish required at least 30 minutes of prep and more than 3 hours of cooking. And there were some hiccups along the way. Lacking marjoram (either fresh or dried), I substituted fresh oregano. 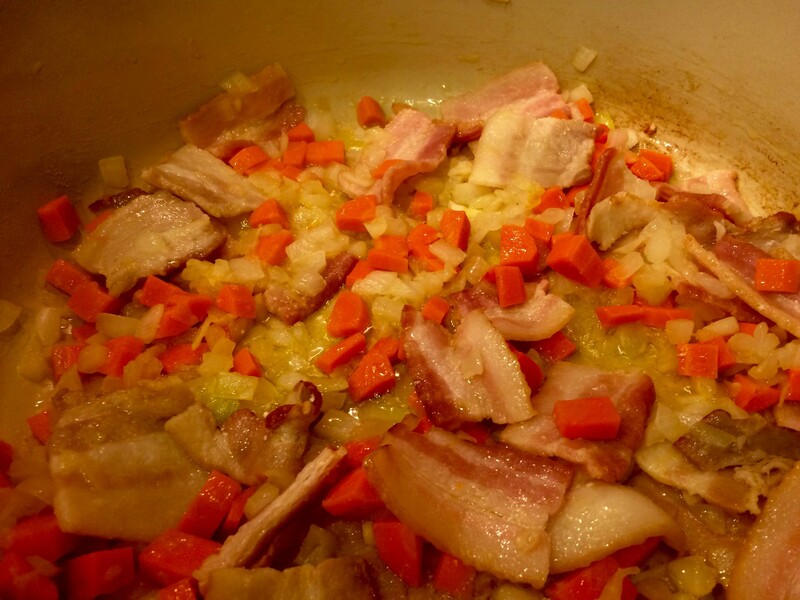 Increasing the amount of onion and carrot required using a bit more oil than called for; my pancetta being somewhat lean didn’t render enough fat to thoroughly brown the oxtails; my soffritto (diced onions, carrots, celery and pancetta) always looked like it was about to burn. Nevertheless, the end result was exceptional. A richly flavored thick sauce, with hints of cinnamon and cloves, coated succulent fall-of-the bone pieces of meat accompanied by silky slivers of celery. 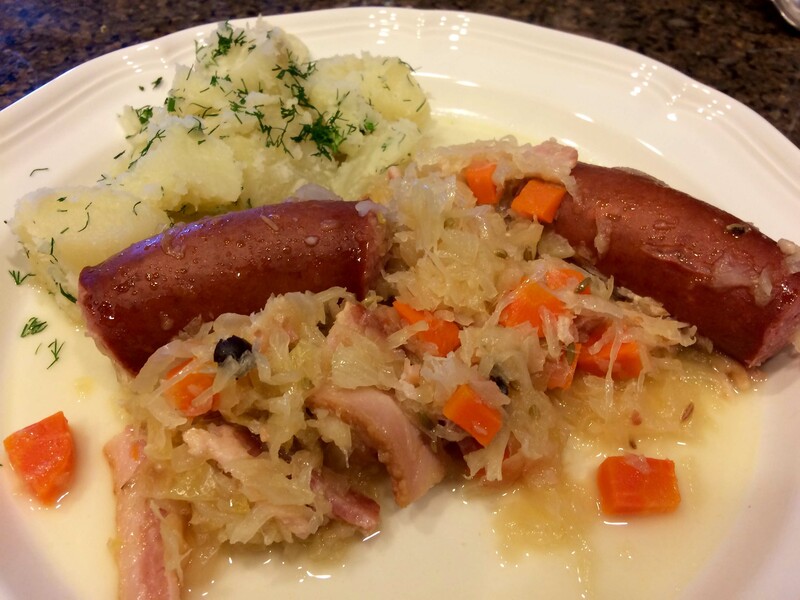 As I was cooking for two, I used a little less than two pounds of meat; however, I kept close to the original amounts of the recipes other ingredients. 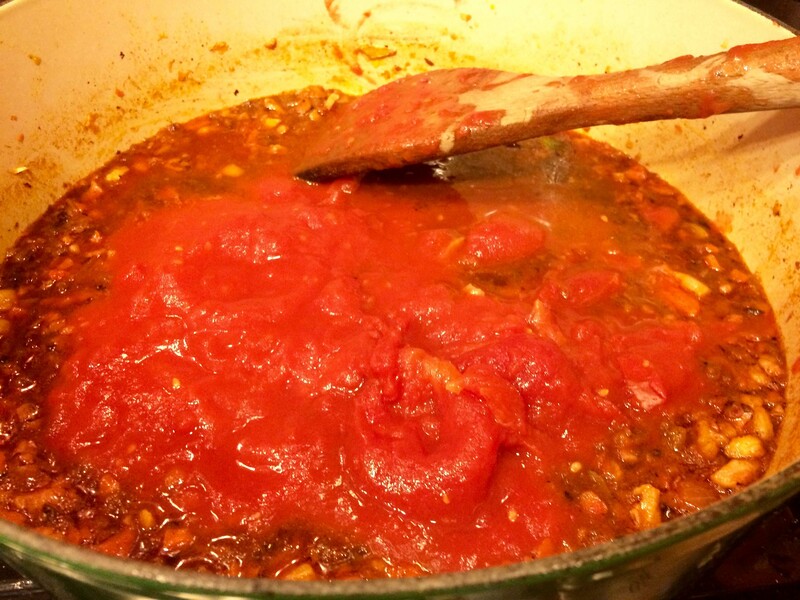 Fortunately, doing so yielded plenty of left over sauce for pasta later this week. Finally, don’t be tempted to substitute red wine for the white. 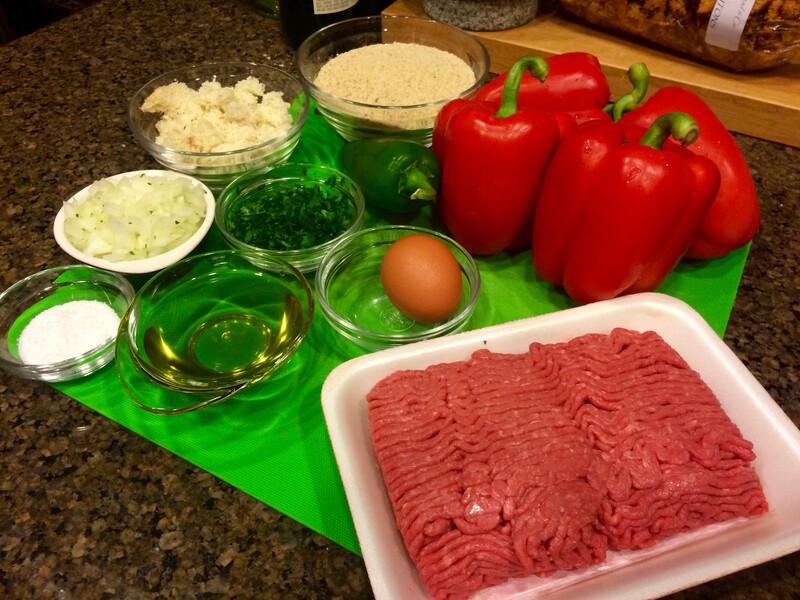 The latter allows the flavors of the meat and the celery to take center stage. 2. 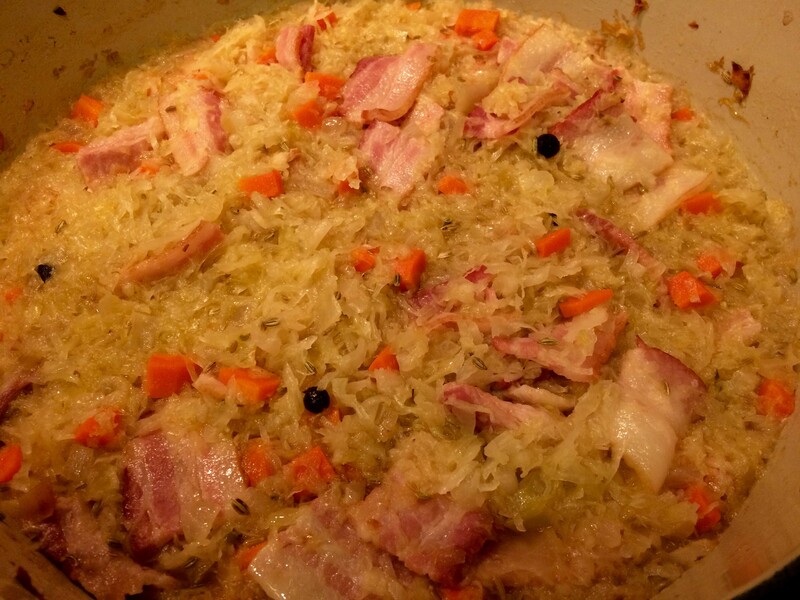 Place pan over medium heat and cook until pancetta renders its fat, about 15 minutes. 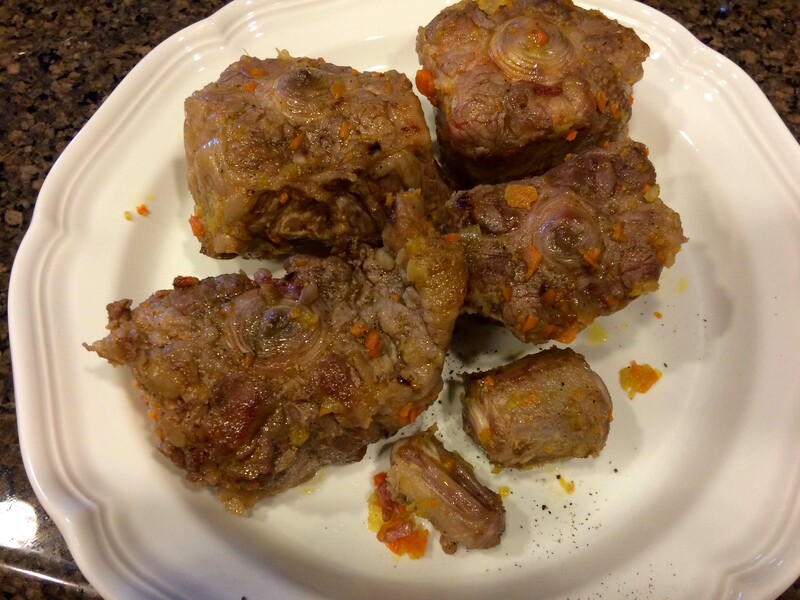 Season oxtails on all sides with salt and pepper, add to the casserole, and brown well on all sides, turning them only after they’ve browned. 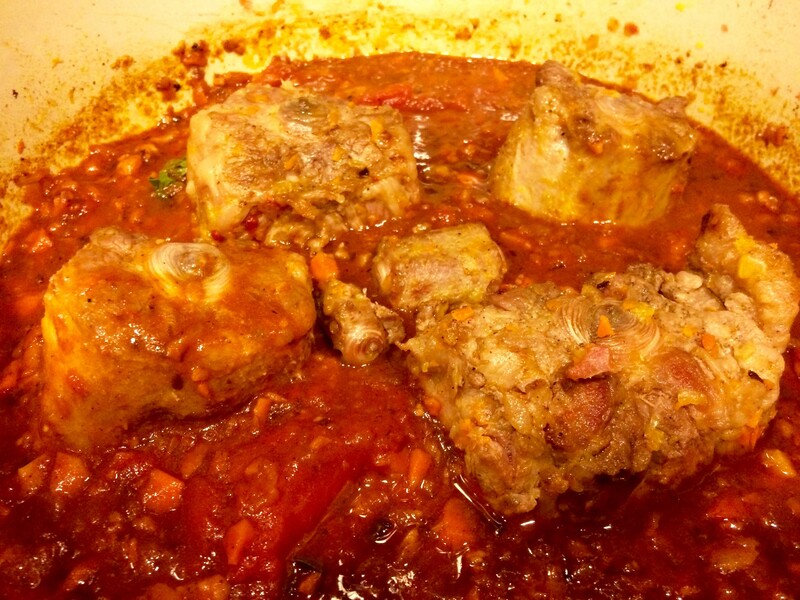 Using tongs, remove oxtails from pan and place in a bowl. Set aside. 3. 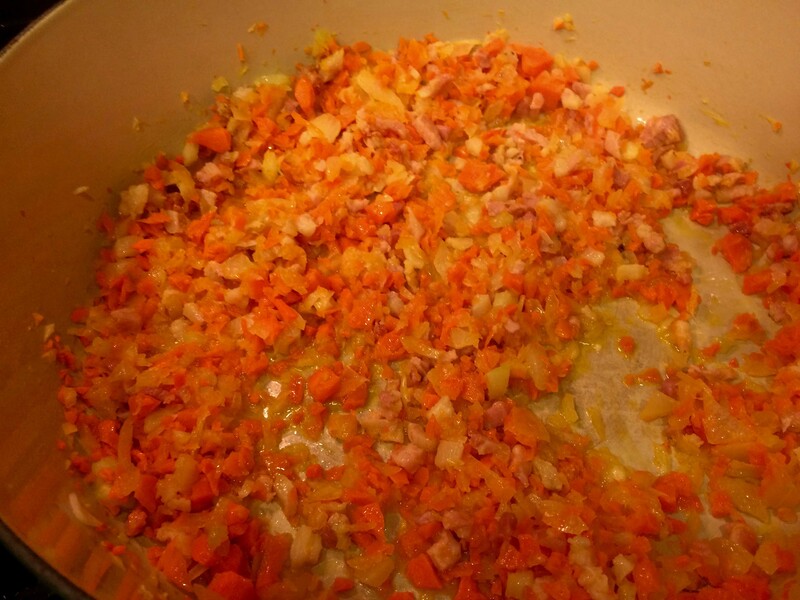 Add the tomato paste to the vegetables in the casserole and cook, stirring, until paste caramelizes, about 2 minutes. 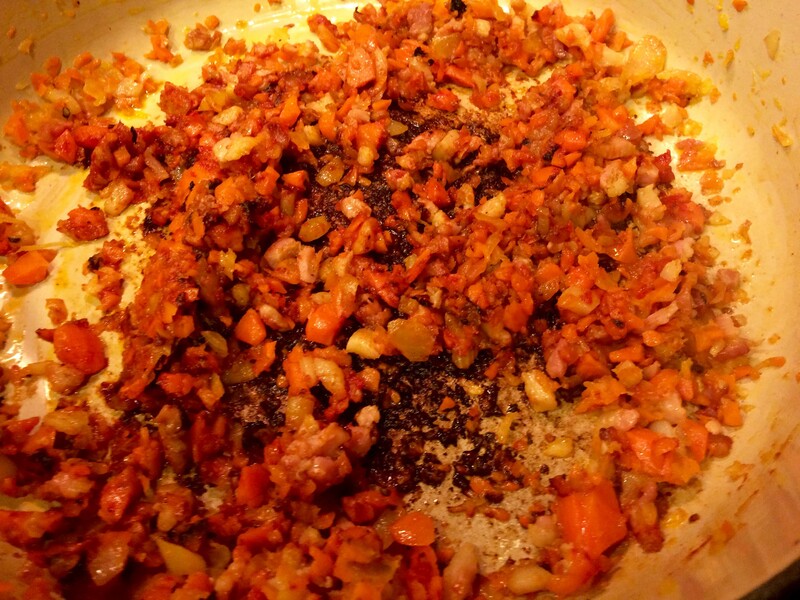 Stir in wine and mix, being sure to scrape up any browned bits sticking to the bottom of the pan. Heat to boiling and cook 3 minutes. 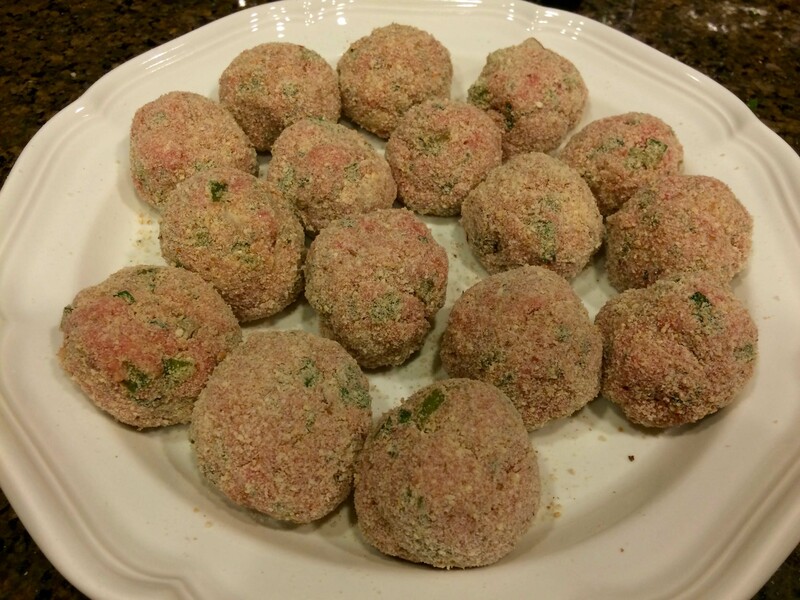 Add oregano, cloves and cinnamon and then tomatoes, squishing them between your fingers as they fall into the pan. 4. Return oxtails to pan. Liquid must be as high as one-third of the ingredients. If not, add a little water. Bring the liquid to a boil, cover pan and place in oven. 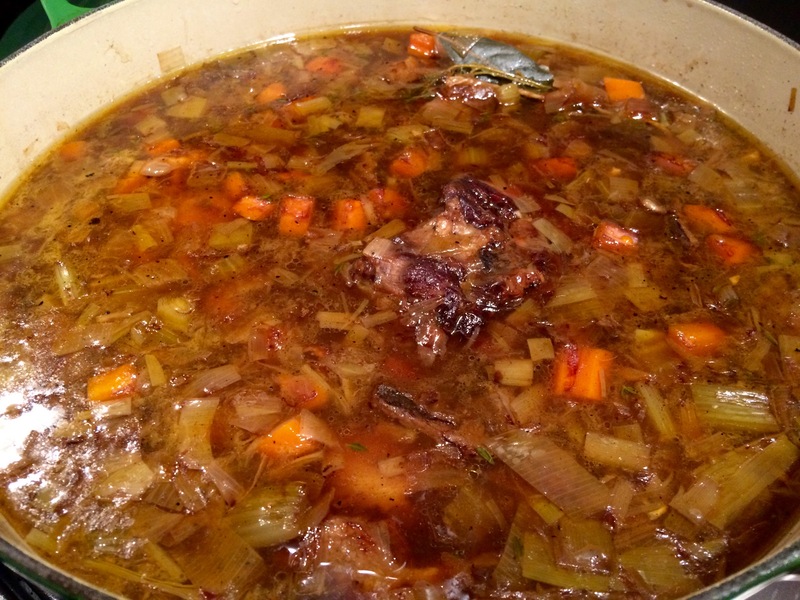 Braise for 1 1/2 hours, turning the oxtails now and then. 6. Remove the pan from the oven and let sit for 15 minutes. Add salt and pepper to taste. 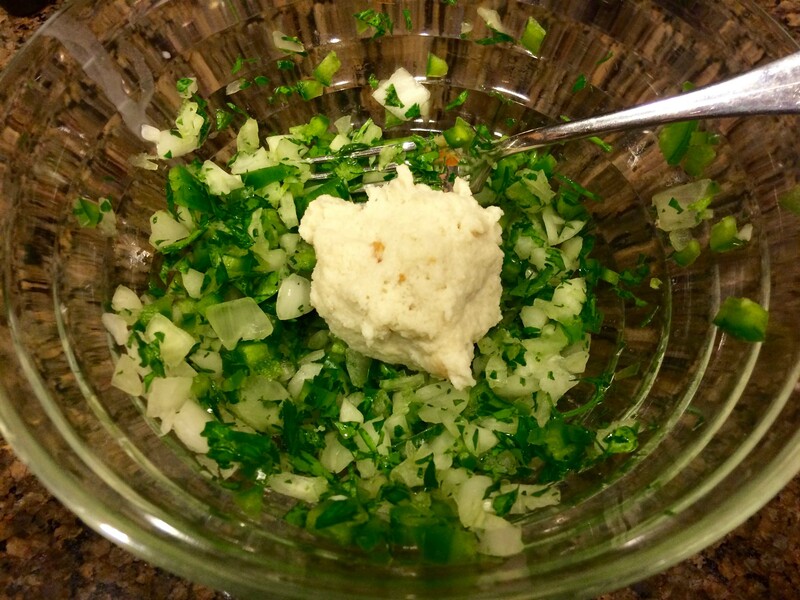 Serve on a large platter or in shallow bowls, making sure everyone gets a bit of the pulpy sauce and celery. 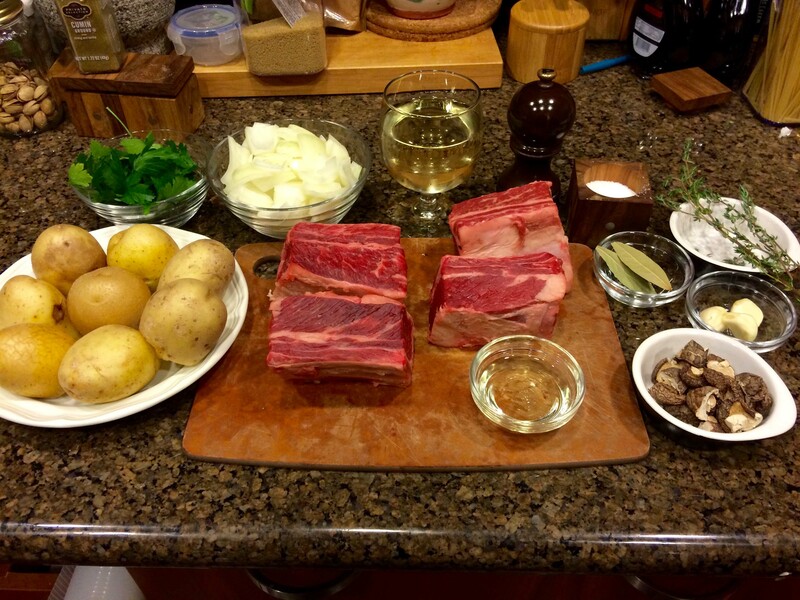 Keeping with my seasonal-cooking bent, I chose on Sunday to make a stew of beef short ribs, mushrooms, and potatoes from Jacques Pepin’s Fast Food My Way. 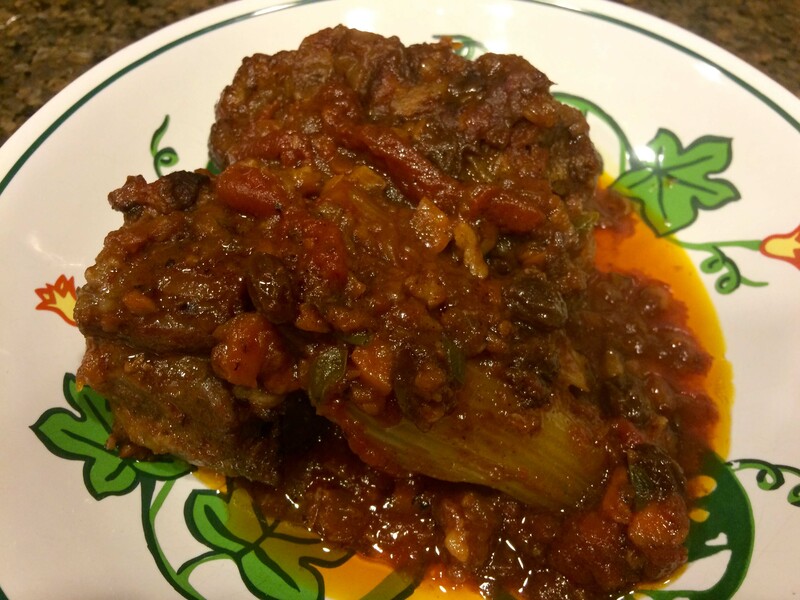 I selected this particular recipe for two reasons: 1) it’s fall, the perfect time for short ribs; 2) the shortened cooking time made possible by the pressure cooker. 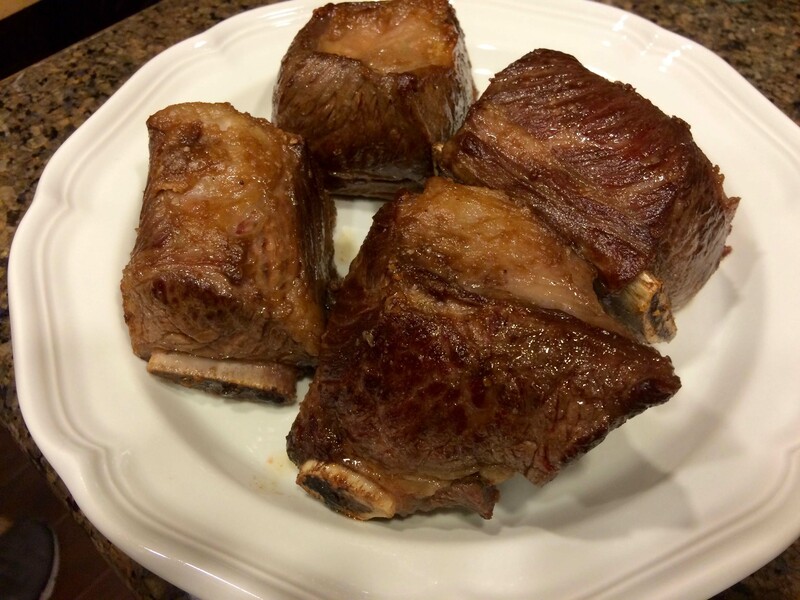 Fortunately, I was able to find some beautiful, thick, and relatively lean bone-in short ribs at my local market. The recipe called for 2 pounds of meat (4 ribs) “as lean and meaty as possible.” Mine weighed about 2.4 pounds. The other ingredients were similarly easy to find, even the dried shiitake mushrooms, which were surprisingly small. I was off to a good start. The prep was also straightforward: trimming the meat, chopping the onion and the parsley, breaking the mushrooms in half and removing the stems, washing the potatoes, etc. Next was browning the meat, a simple task in an electric pressure cooker. All that was left was to add the remaining ingredients to the pot, lock the lid, set the cooker to high-pressure for 30 minutes. Of course, as with any pressure-cooker recipe, there’s the wait time for the cooker to reach full pressure. 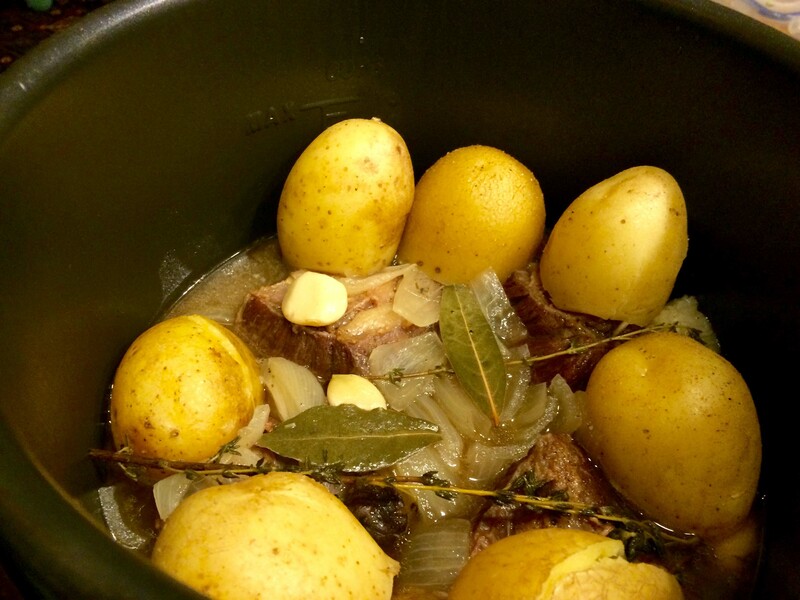 So altogether the cooking time was 45 or 50 minutes, during which time the aroma from the stew whetted our appetites. Because I was craving carbs, I also prepared some whole-wheat couscous as a side even though the stew had plenty of potatoes. The timer went off; I released the pressure, carefully lifted the lid, and wow everything looked perfect. 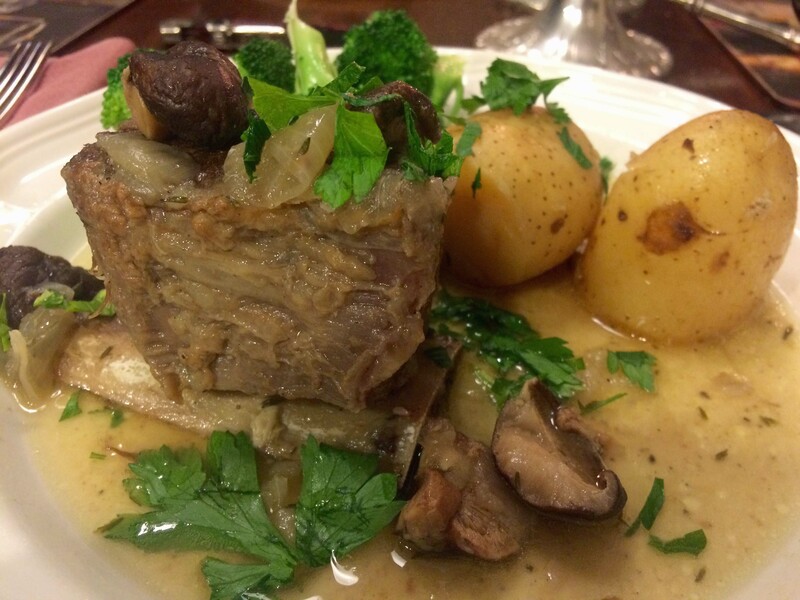 The mushrooms, which as directed by the recipe had not been soaked, were wonderfully chewy and packed with flavor; the potatoes were smooth and silky and had absorbed the cooking juices; the ribs. . .Well, that’s another story. After taking his first bite of the meat, my husband shot me a glance that immediately let me know something wasn’t right. So I took a bite and yep; something was definitely wrong. 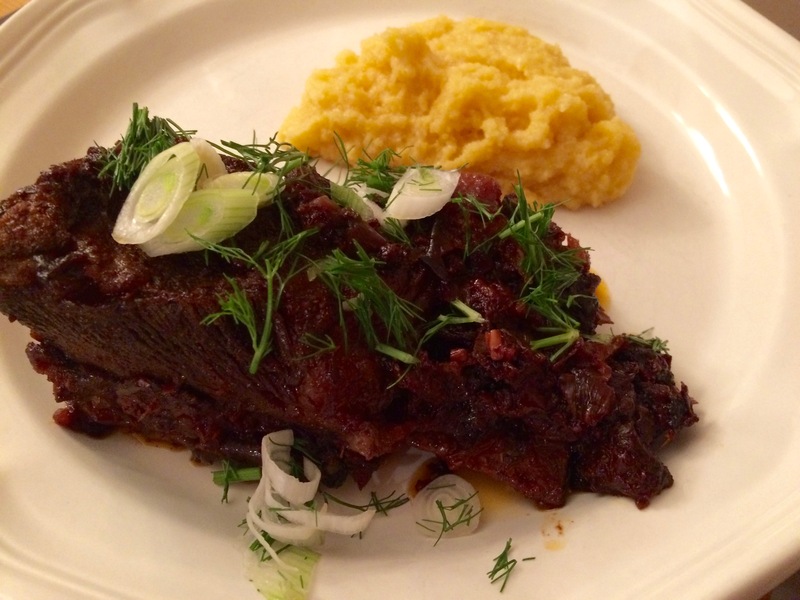 The flavor was exceptional, beefy and woodsy from the mushrooms; but the texture was tough, far from tender. I’m not sure what went wrong; maybe the ribs were too thick; perhaps I should have extended the cooking time by another 15 minutes. Not being an expert with the pressure cooker, I’m not certain. Most of the cookbooks I checked afterwards seemed to agree with Pepin’s 30 minutes. Thankfully, we had two ribs with loads of sauce, mushrooms, and potatoes left over. I was determined to get a better meal the next time around. So yesterday, Monday, I decided to reheat the stew in a small enameled cast-iron Dutch oven, covered and placed on a very low flame for an hour. 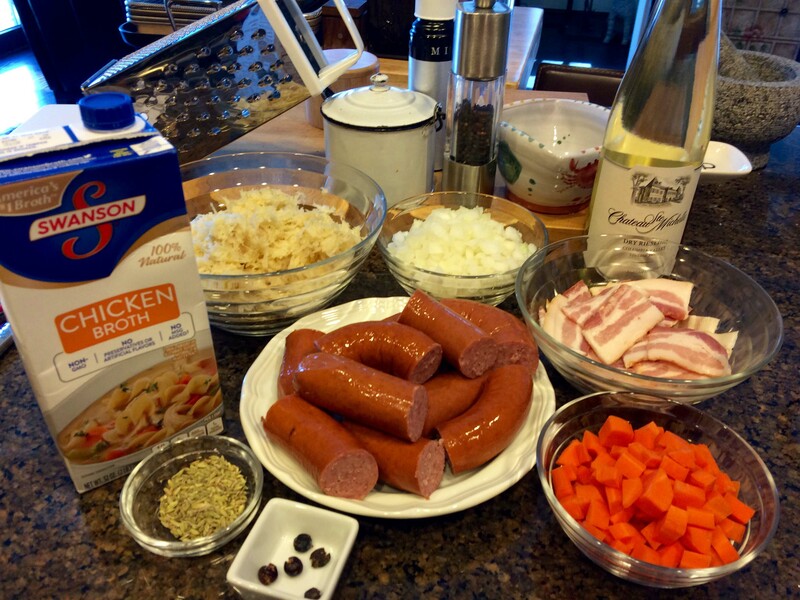 To provide some moisture, I added a good splash of the same white wine I had used the night before. I’m happy to report that this time the meat was perfectly tender and, as is often the case with left-over stew, even more richly flavored. 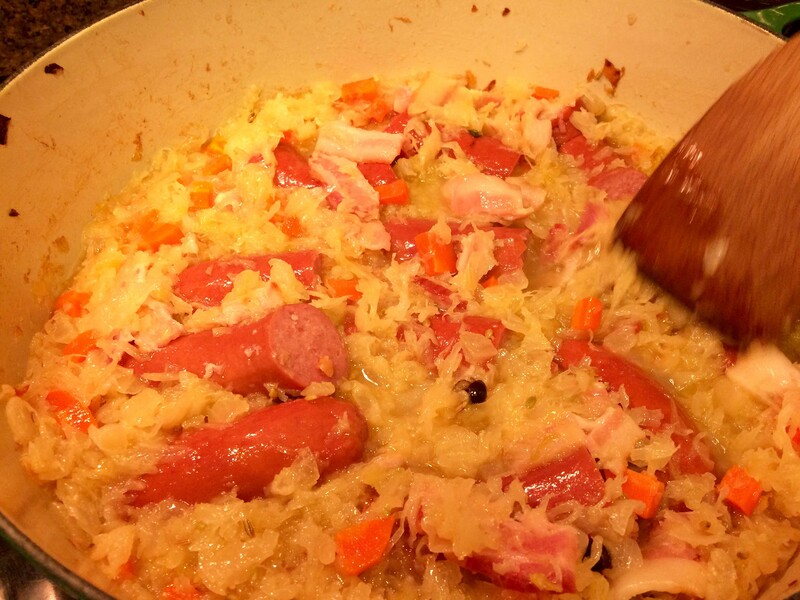 I’ll definitely make this recipe again, but more than likely, I’ll forego the pressure cooker in favor of my dependable cast-iron Dutch oven—even if it takes 4 times as long to cook. 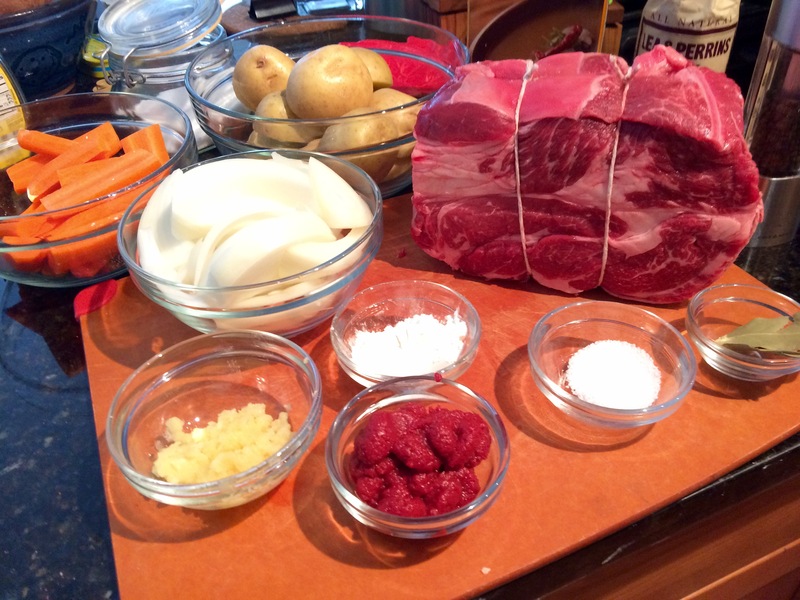 1-Remove any surface fat and sinews from the short ribs. 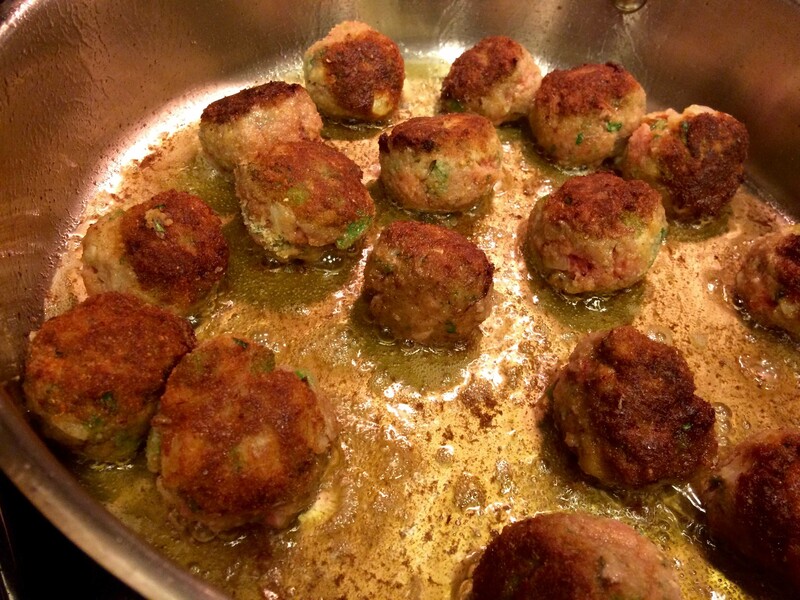 Place them in a pressure cooker with oil and brown over high heat for about 8 minutes, turning occasionally, until well browned on all sides. 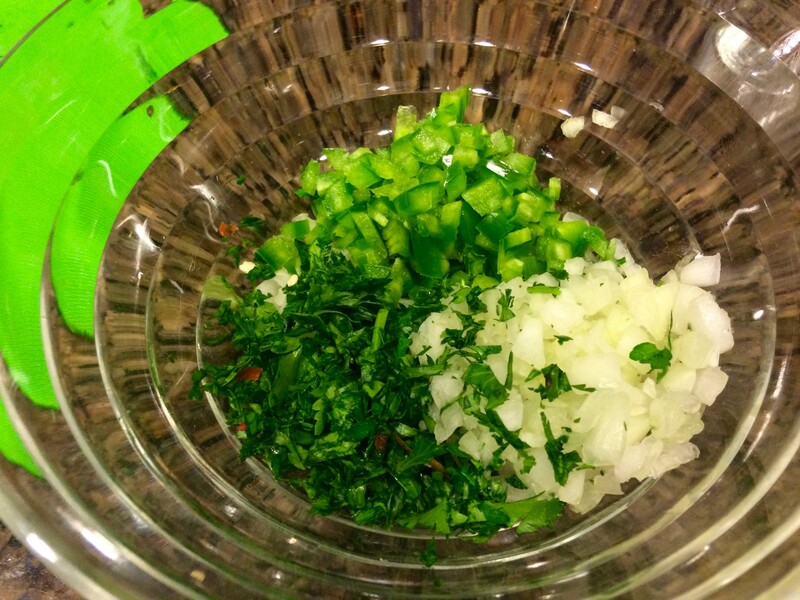 Remove from the heat and pour off any fat. 2-Add the mushrooms, then the remaining ingredients, except the parsley, and cover tightly with the pressure-cooker lid. Cook over high heat until the gauge indicates that the stew is cooking on high pressure. Reduce the heat to maintain the pressure and cook for 30 minutes. 3-Decompress the pressure cooker according to the manufacturer’s instructions. 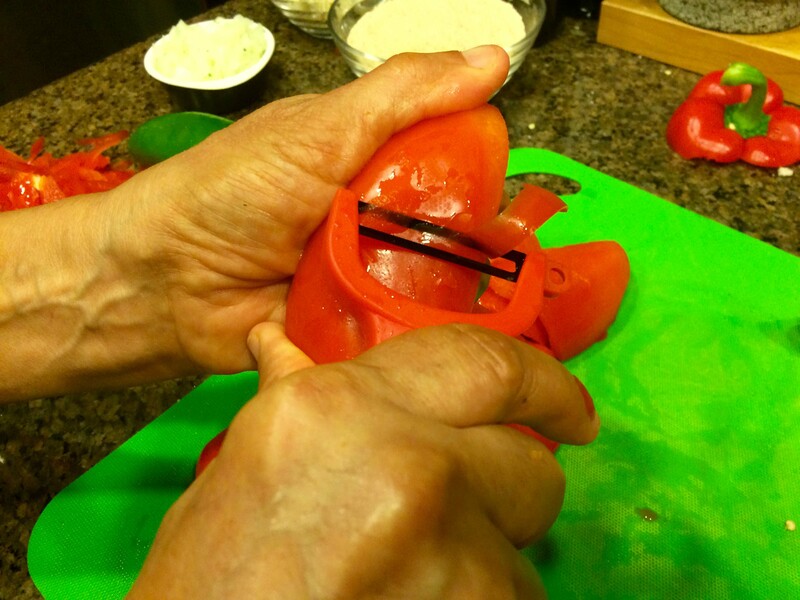 Open the pressure cooker and taste for seasonings, adding additional salt and pepper if needed. 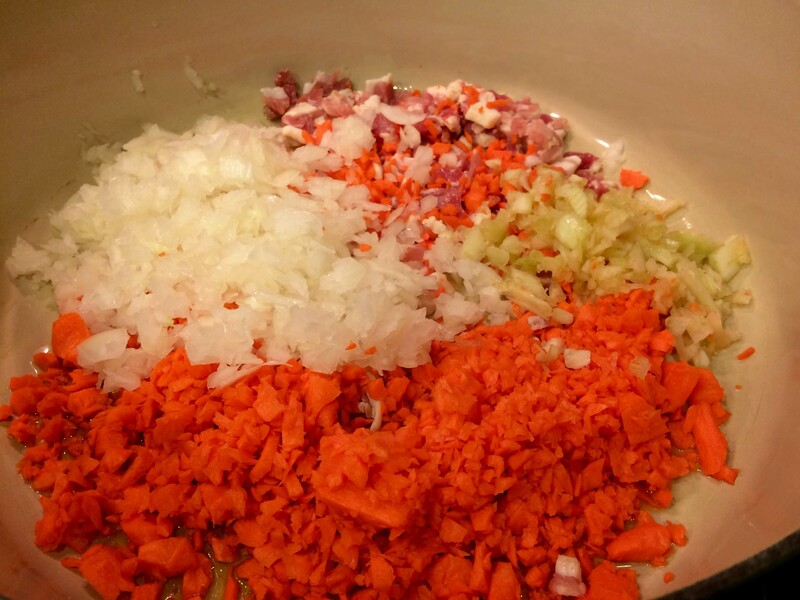 Divide the stew among four warmed soup plates, sprinkle with parsley, and serve immediately. As with any pressure-cooker recipe, be sure to follow the instructions of your cooker’s manufacturer. It wasn’t that long ago when I was eating steak four or five nights a week. Excessive? Yes. But I was single then, often on the road, and a simple strip or sliced steak was my comfort food as well as the perfect foil for the Italian wines I was representing at the time. Alas, my quasi Paleo diet caught up with me when my cholesterol level neared 300 and my doctor, along with my spouse, said basta. Now on a more healthful diet, which has brought my cholesterol way down to normal levels, I enjoy red meat at most once a week. 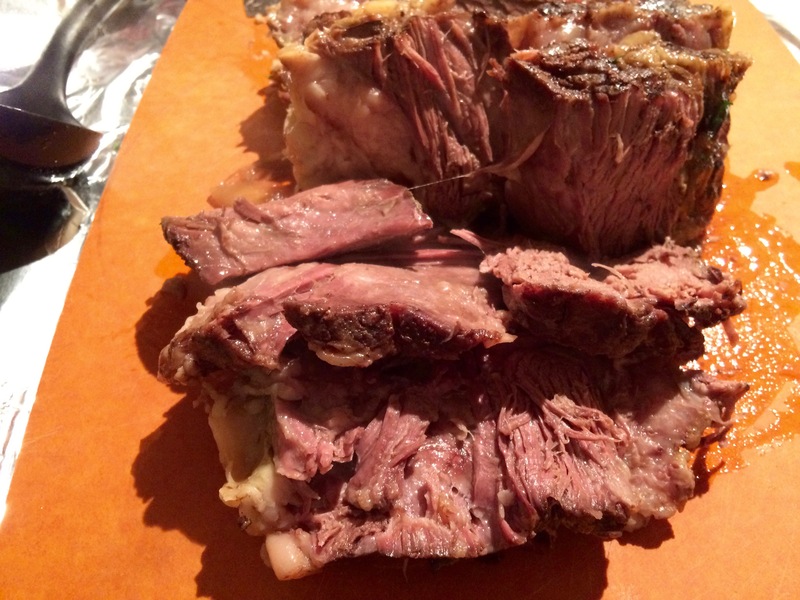 More often than not, when indulging, I still opt for steak, but once in a while I go for grilled, roasted, or braised dishes like short ribs or lamb shanks or, as I did the other night, a roast beef. 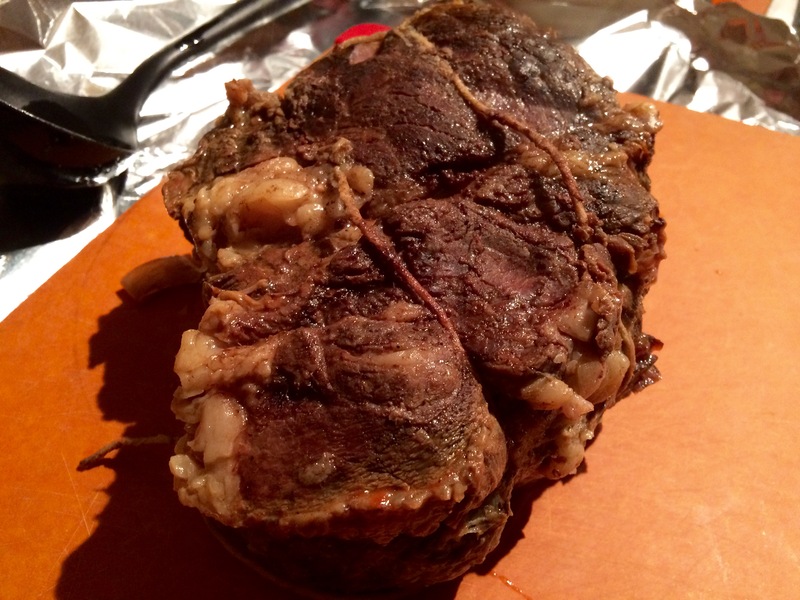 This roast, however, was not the typical rib, sirloin, chuck, or round roast. It was a tri-tip roast. 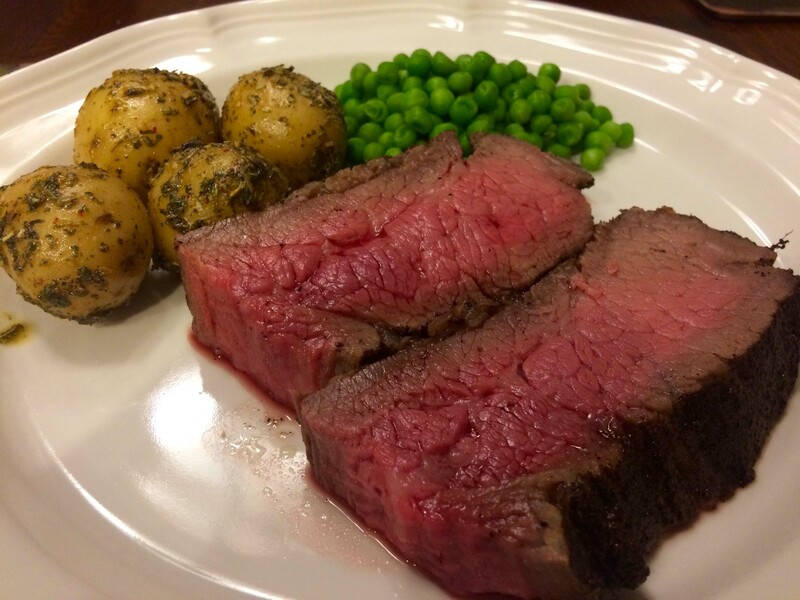 I had never heard of this cut before, but a quick search on my phone informed me that it’s a popular west-coast cut and so tender that it’s sometimes referred to as the “poor man’s prime rib or filet mignon.” I was still hesitant to try it, but when my better half pointed out that it was on sale at 60% off, I thought I’d give it a go. When we returned home, I went back online to search for a recipe and found many. 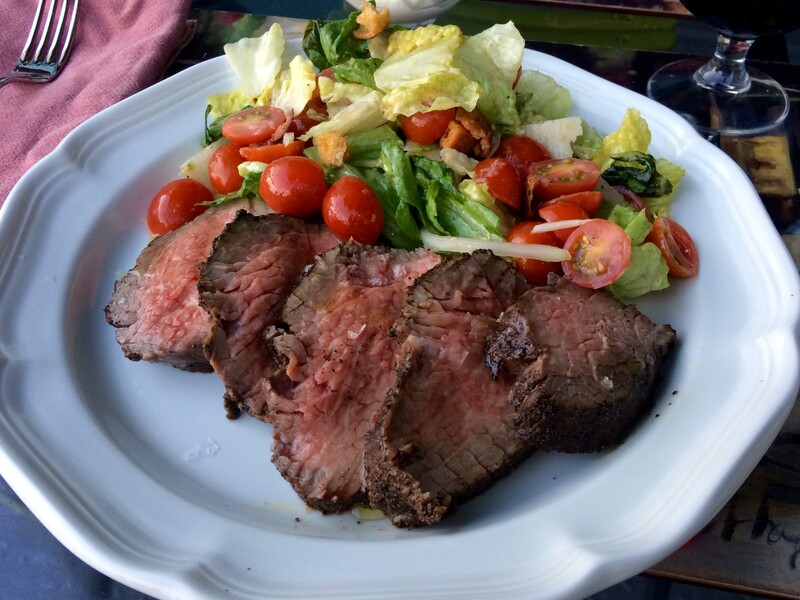 I finally settled on what was perhaps the easiest and fastest, which I found on the New York Times “Cooking” website, Grilled or Oven-Roasted Santa Maria Tri-tip. 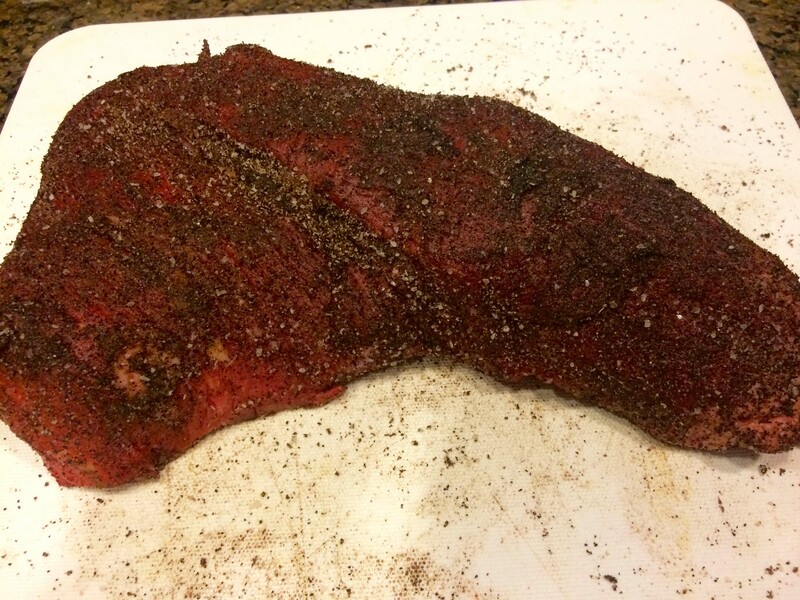 It had two ingredients: a tri-tip roast and a beef-rub of your choice. As I’m not much into grilling or rubs, I opted for the oven-roasted version and followed the recipe’s link to an All-Purpose California Rub. This roast proved to be perfect for a weeknight meal, taking around 40 minutes to cook, or a little more if you prefer your beef more cooked. 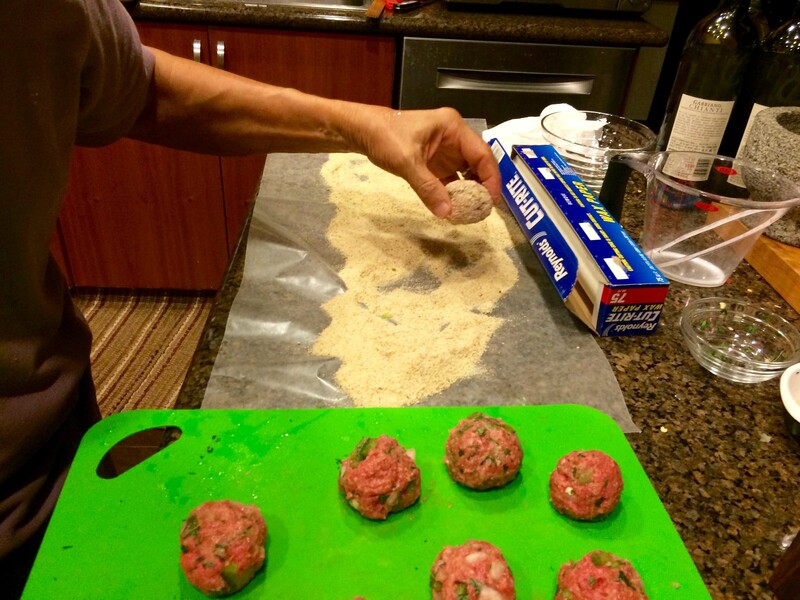 The rub takes only minutes to prepare. After it’s massaged into the meat, the roast should be covered and refrigerated for at least an hour or even better overnight. 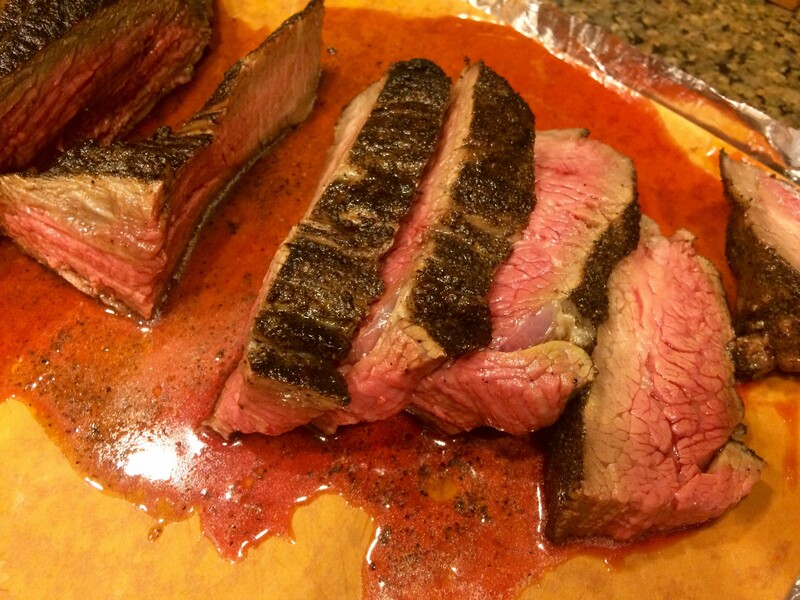 I think our tri-tip lived up to its reputation for being tender and I would say had more flavor than a filet mignon. I served the roast with steamed herbed potatoes and peas. A few days later, we enjoyed it sliced thin at room temperature accompanied by a salad. 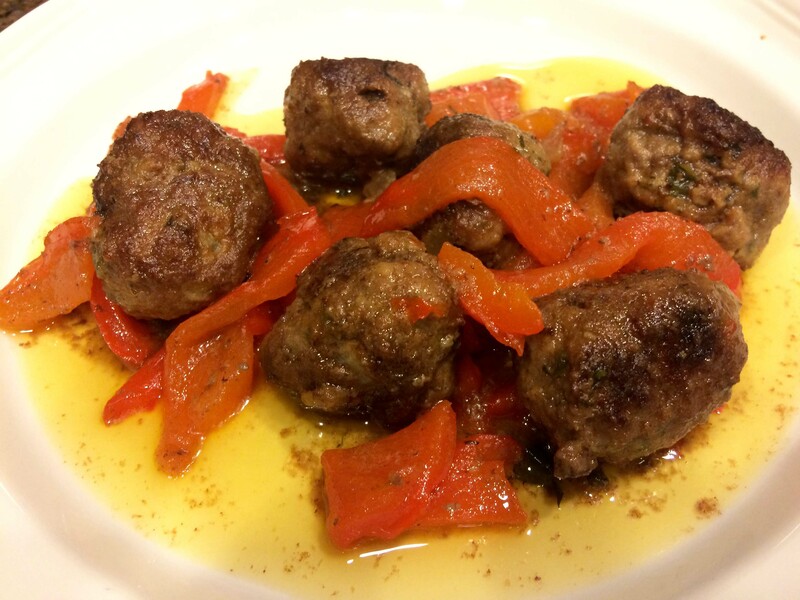 Below is the recipe for the oven-roasted version of this dish. If you prefer grilling, click on the New York Times link above for the full recipe. 1. Trim silver skin. 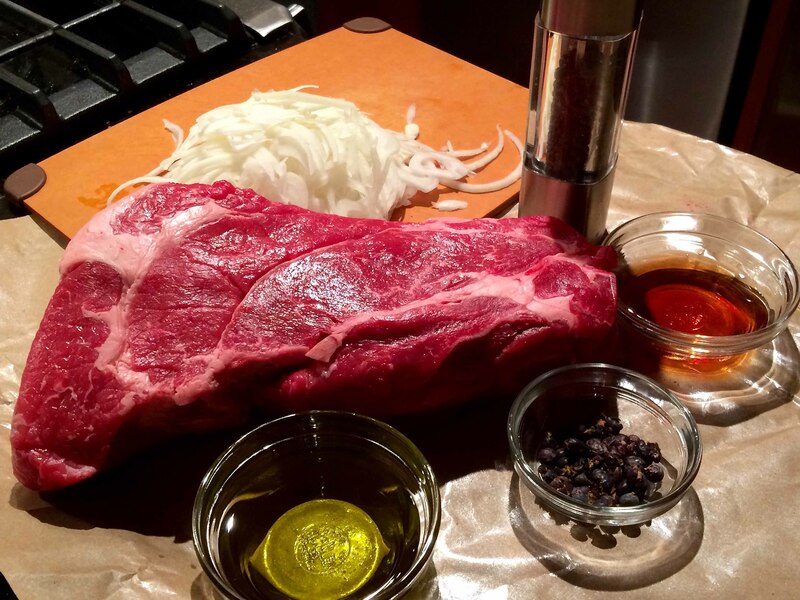 The meat may have a thick layer of fat, some of which can be sliced off, but keep a good amount to help baste meat. 2. 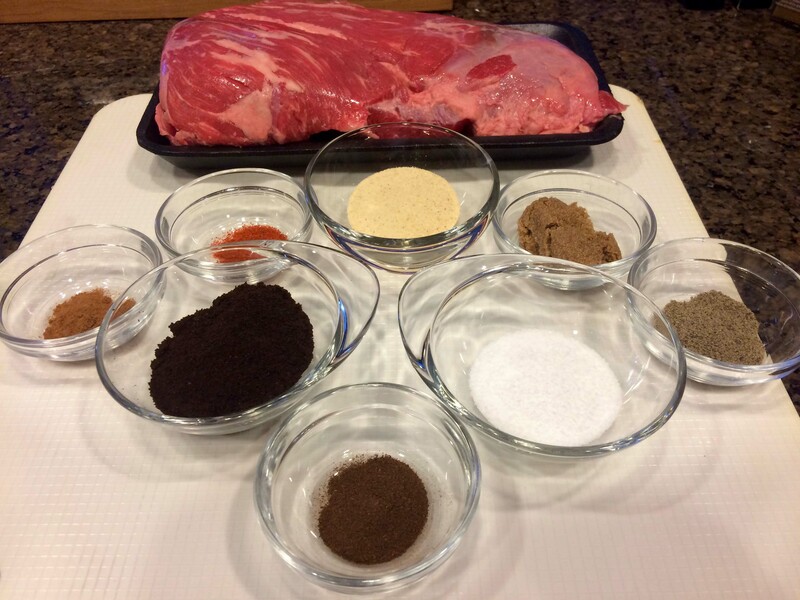 Sprinkle meat with rub and massage lightly all over. 3. Cover and refrigerate at least an hour or as long as overnight. 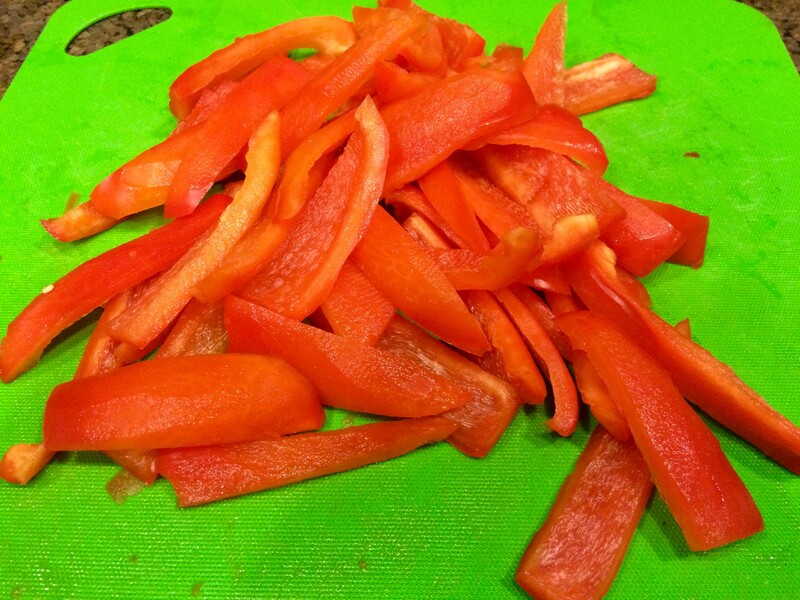 Remove from refrigerator an hour before cooking. 4. Heat oven to 350 degrees. Add 2 tablespoons of olive oil or other cooking oil to a large, heavy ovenproof pan. 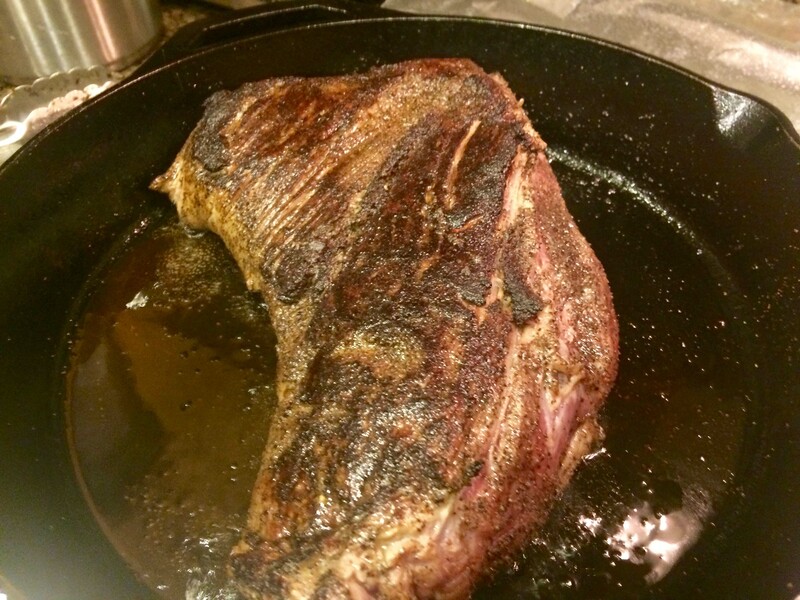 On stove top, heat on high until pan is very hot, then add tri-tip, fat side down. 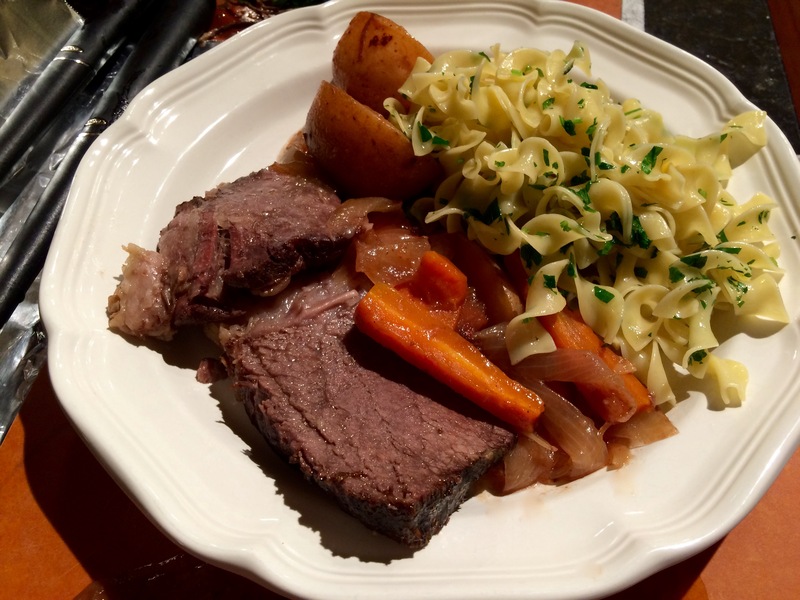 Turn heat to medium-high and sear roast for about 4 minutes. 5. Turn the roast and put it in the oven. Cook it for about 10 minutes a pound, checking with an instant-read thermometer until it reaches 130 degrees for medium-rare. 6. 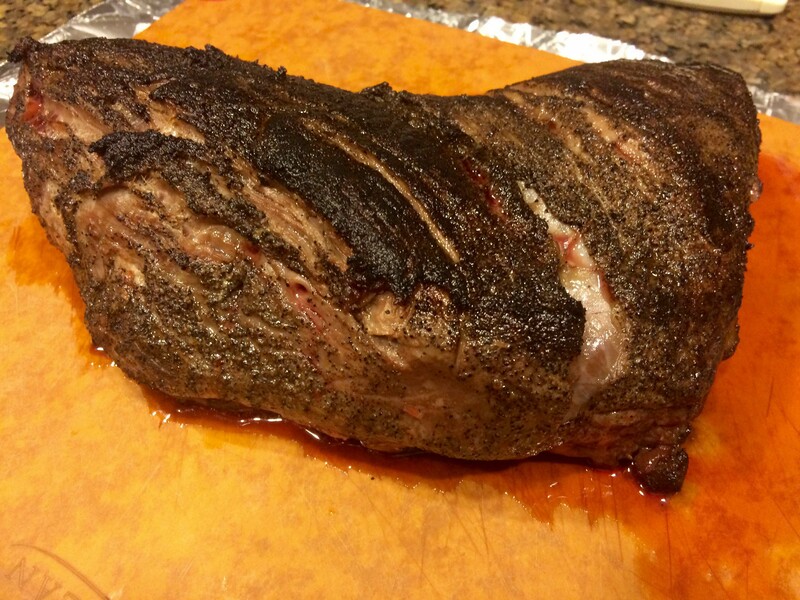 Rest roast on a cutting board 10 to 20 minutes. Slice against the grain. 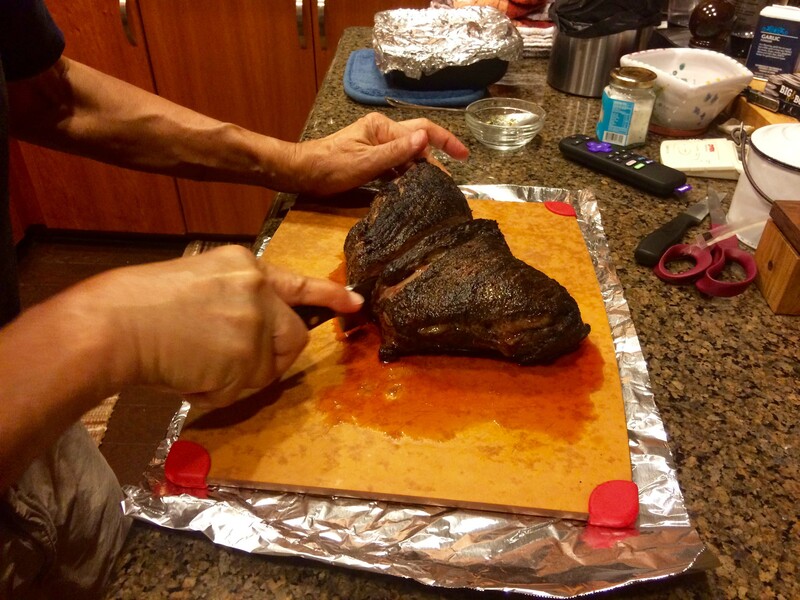 The roast is shaped like a boomerang, so either cut it in half at the center of the angle, or slice against the grain on one side, turn the roast and slice against the grain on the other side. Two days later, the roast made its way back to our table. 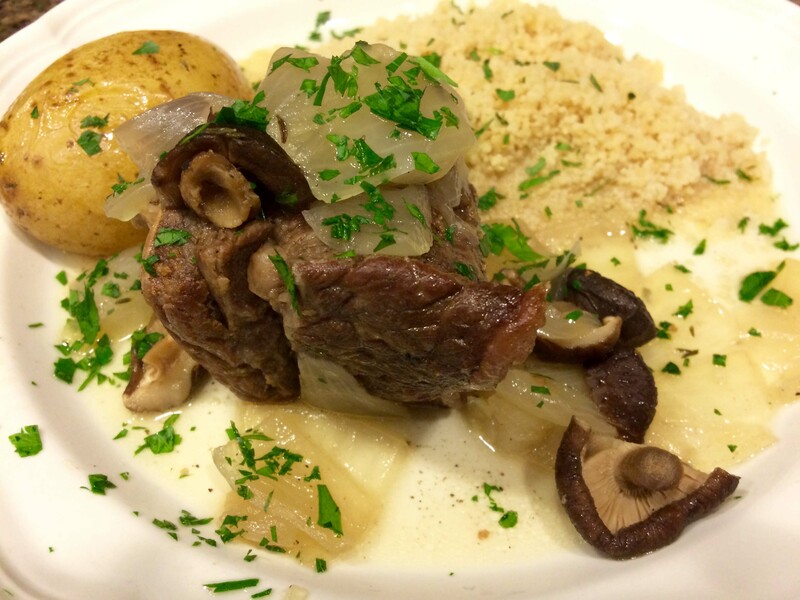 Given the reluctance of spring to appear in New York City and finding a $6.00 off a pound sale on short ribs at my local market, I chose to make a braised dish more suitable for winter. The recipe is from the New York Times Cooking website and its blend of spices and prunes with fennel and leeks made it most appealing for a chilly weekday night supper. I had also planned to photograph the preparation of this dish, but just as I started to cook, our cable repairman showed up. What I thought would be a twenty-minute service call wound up taking almost three hours, including assisting the repairman with un-mounting a wall-mounted 55” television, which given the disparity in our heights (he stood 6’ tall and I’m 5’3”), was not an easy task. As a result, I had to rush to get the ribs into the oven for a three-hour braise so that we could have supper on the table by 9PM. 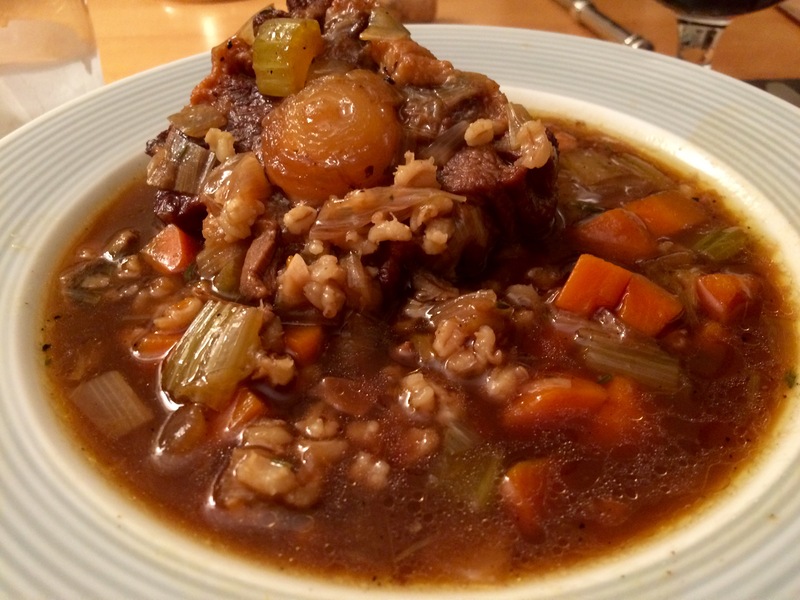 Despite the gloomy cold day and the cable madness, our day ended well thanks to this truly delicious braise. 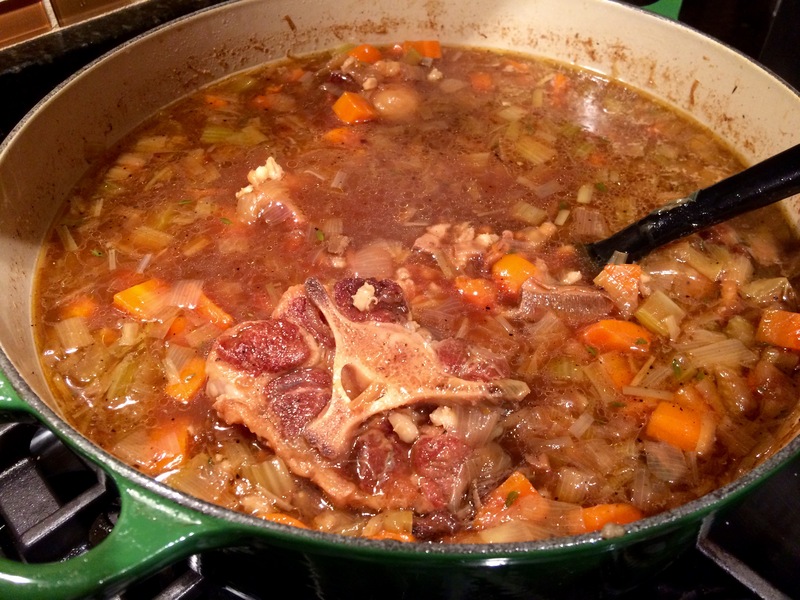 Although the recipe calls for a pressure cooker, the website gave options for a Dutch oven as well as for a slow cooker. I chose to braise the ribs in a enameled-cast iron Dutch oven in a 325°F oven for 3 hours. 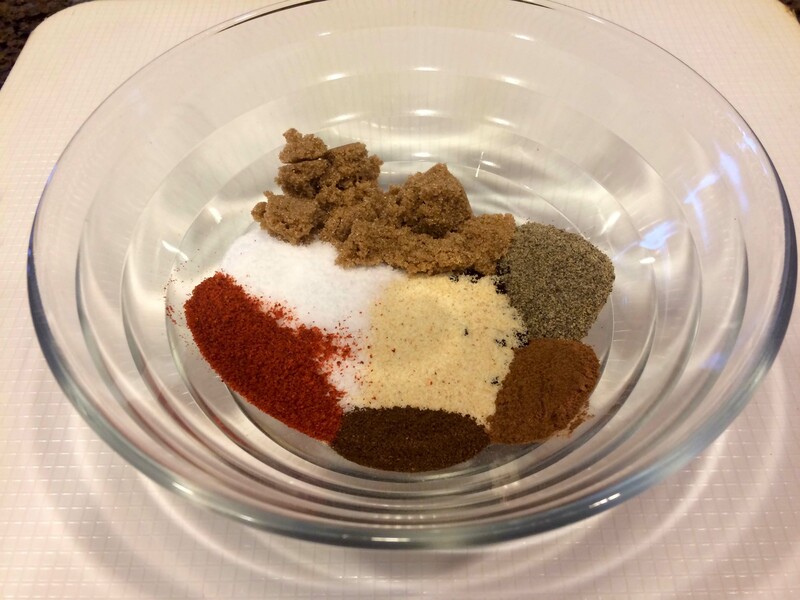 If you’re not a fan of highly spiced food, you may want to reduce the amount of chipotle chile powder. I also found that the amount of liquid called for (1 cup of wine) resulted in a rather thick sauce. This amount may work for a pressure cooker, but if you choose to oven braise, I’d recommend at least doubling the amount of liquid. Last night we entertained several friends and decided to keep things simple. It was going to be a busy day for me and the forecast was for a chilly night. So I turned to my slow cooker to free me from the kitchen. I thought a pot roast would be perfect. 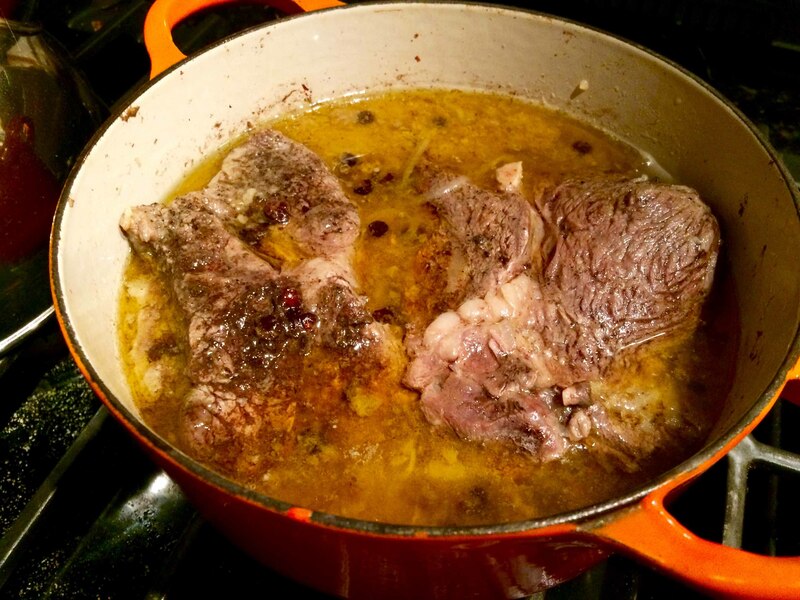 For a recipe, I turned to Martha Stewart’s collection of one-pot recipes, one of which called for beef chuck roast that didn’t need to be browned before braising. Even better–more free time. The recipe along with a video is also available here online. I particularly like this recipe because, without any herbs and a minimum of seasoning, it really lets the flavor of meat shine. My only changes to the recipe were the addition of a bay leaf, a few more carrots and potatoes as well as a slightly larger roast than called for. I also opted for 8 hours on low rather than 5 on high since I think it makes for a more tender roast. 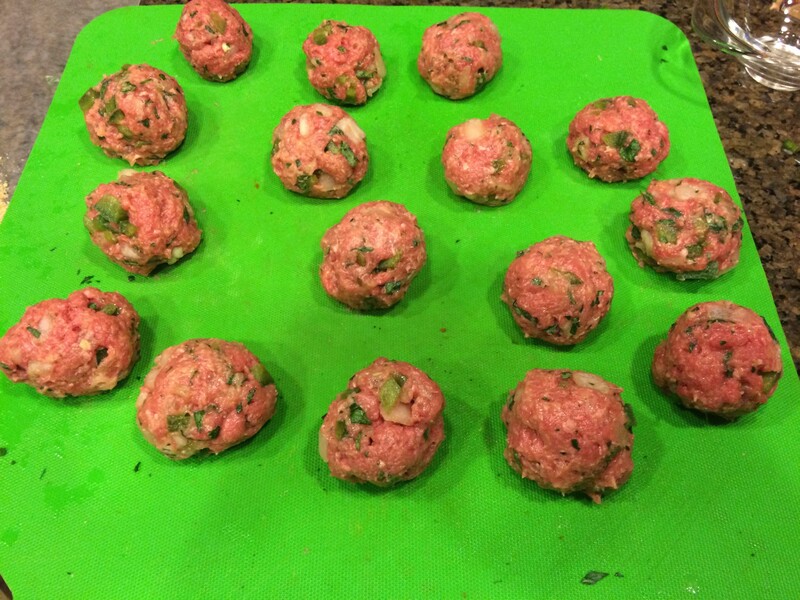 I served the meat with egg noodles tossed with chopped flat leaf parsley and olive oil. 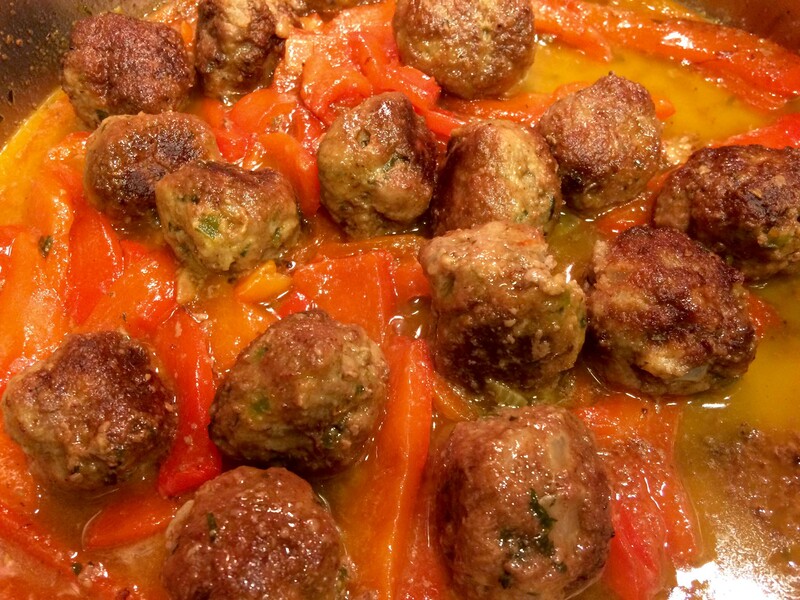 Our guests must have enjoyed this dish as much as we do as there were no leftovers whatsoever. 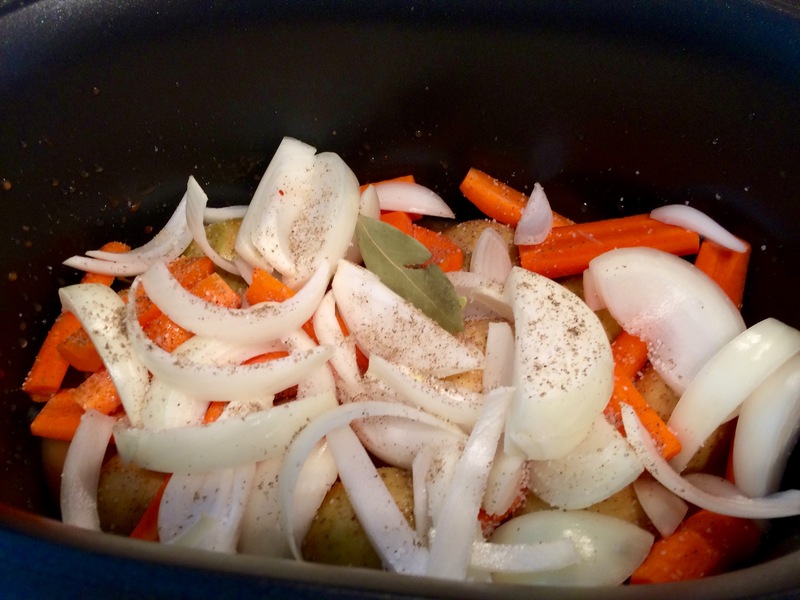 In a 5- to 6-quart slow cooker, stir together cornstarch and 2 tablespoons broth until smooth. 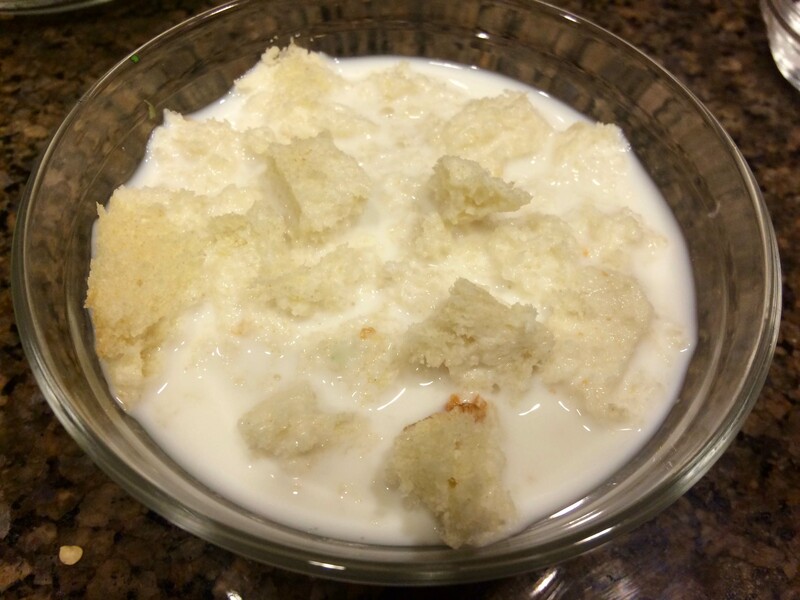 (I prefer to make this slurry in a small dish and then add it to the cooker.) Add remaining broth, tomato paste, potatoes, carrots, onion, bay leaf, and Worcestershire. Season with salt and pepper and toss. 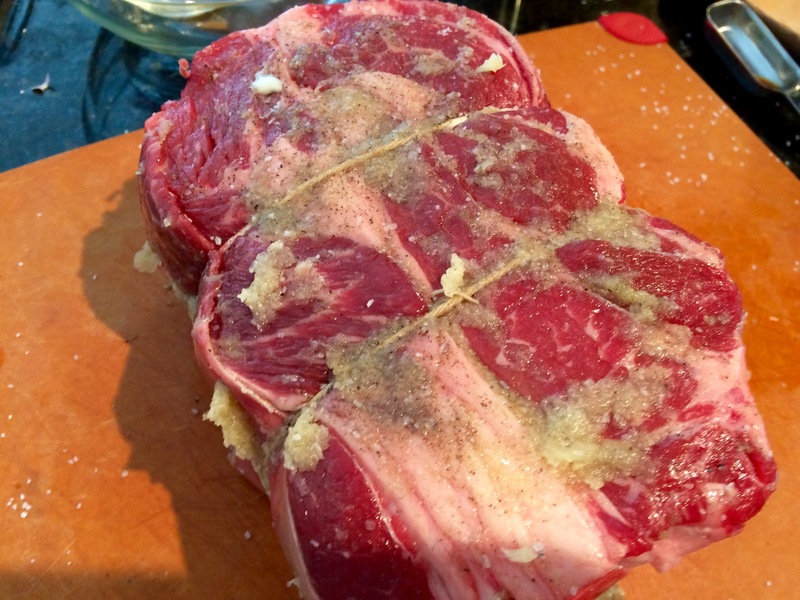 Season roast with 1 teaspoon salt and 1/2 teaspoon pepper, and rub with garlic. Place on top of vegetables. Cover and cook on high until roast is fork-tender, 5 hours (or 8 hours on low). 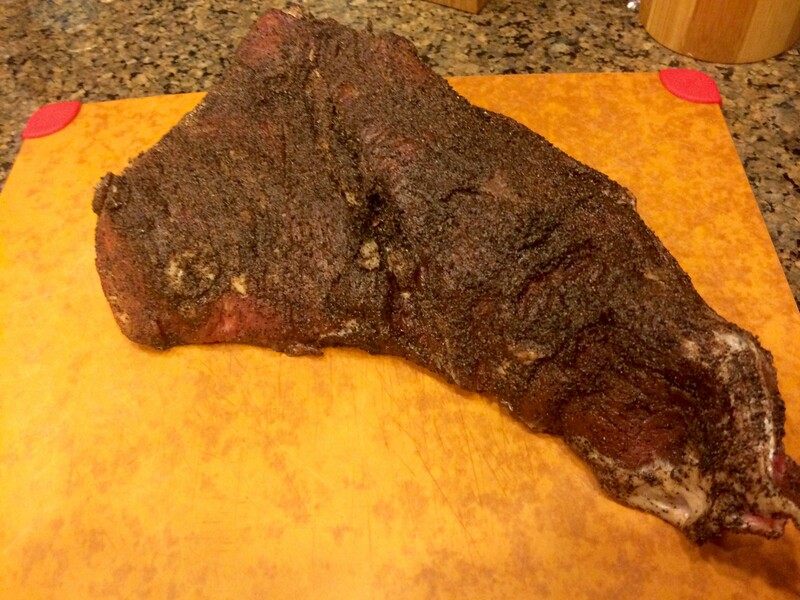 Transfer roast to a cutting board; thinly slice against the grain. 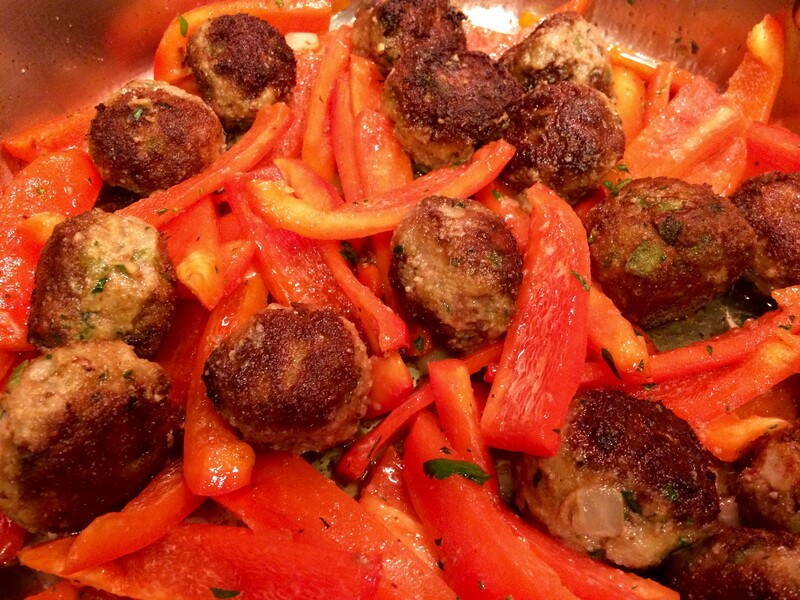 Place vegetables in a serving dish; skim fat from pan juices, then pour through a fine-mesh sieve, if desired. Serve roast and vegetables drizzled with juices. As a child, I often accompanied my mother or my aunt when they went food shopping, which they did on an almost daily basis. Much to my chagrin, however, these excursions took considerable time since they opted to shop at small mom-and-pop stores rather than at the supermarket. Typically, we’d start at the salumeria for cold cuts and cheese, move on to the greengrocer for vegetables, and then end up at either the butcher or fishmonger. At each stop, they seemed to have a warm relationship with the proprietors, asking after their children, listening to their stories, offering them advice, or lending a sympathetic ear. It’s then that I realized one of the reasons why my mother and aunt were always so pleasant with all the shop owners: they were sure to get the best ingredients for our family. In Italian cooking, it’s essential that the basic ingredients, the prima materia, be of the highest quality because the cuisine is so minimalist. This was a continuing theme of Marcella Hazan’s cookbooks and it seems to have influenced her son, Giuliano. 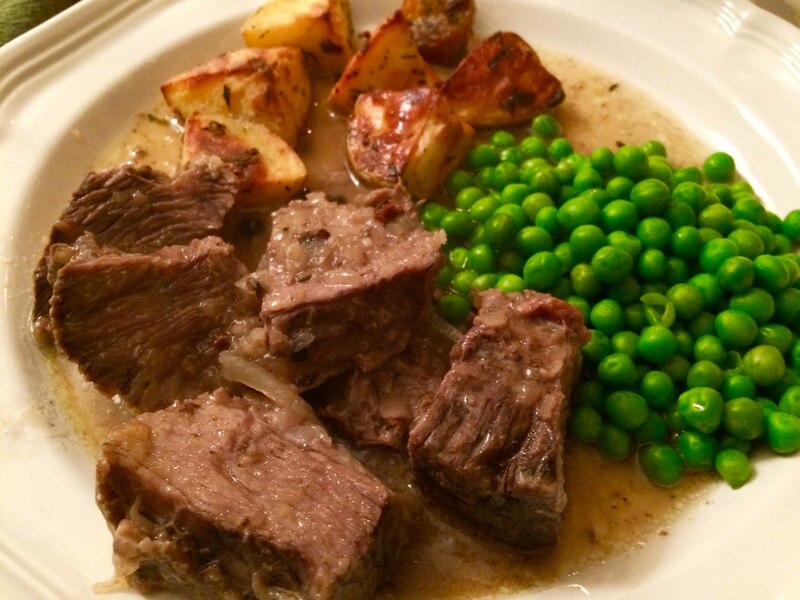 An example is his recipe from Every Night Italian for beef slowly simmered with onions and juniper berries, which I prepared recently for a weekday supper and served with garlic-roasted potatoes and peas. Choose a heavy-bottomed braising pot with a tight-fitting lid, preferably enameled cast iron, just large enough to accommodate the meat. 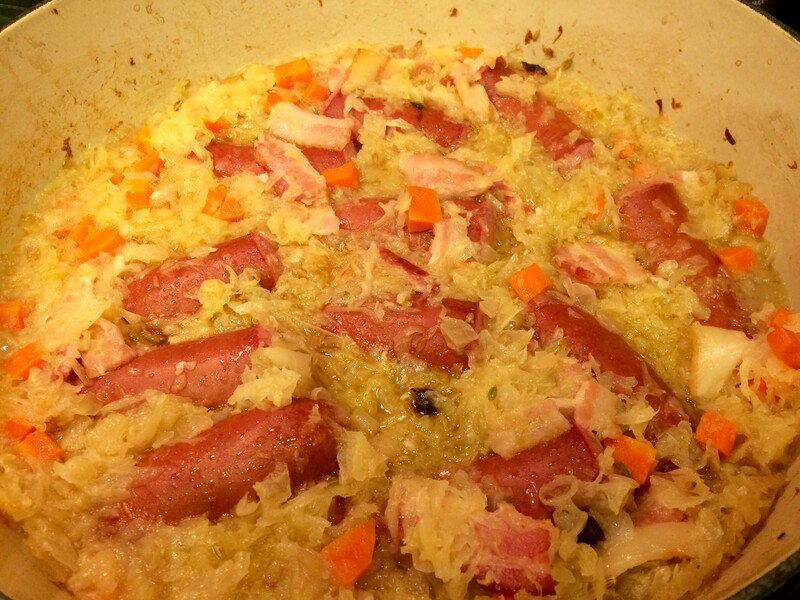 Put the olive oil and the onions in the pot and place the meat on top. 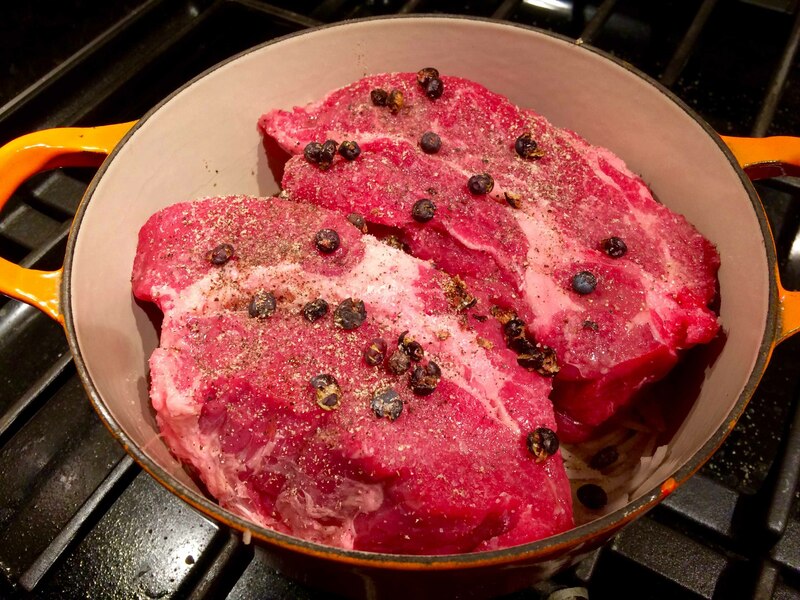 Add the crushed juniper berries, the vinegar, and season with salt and pepper. When you hear the contents of the pot bubbling, remove the lid and adjust the heat so that meat cooks at a very gentle simmer. 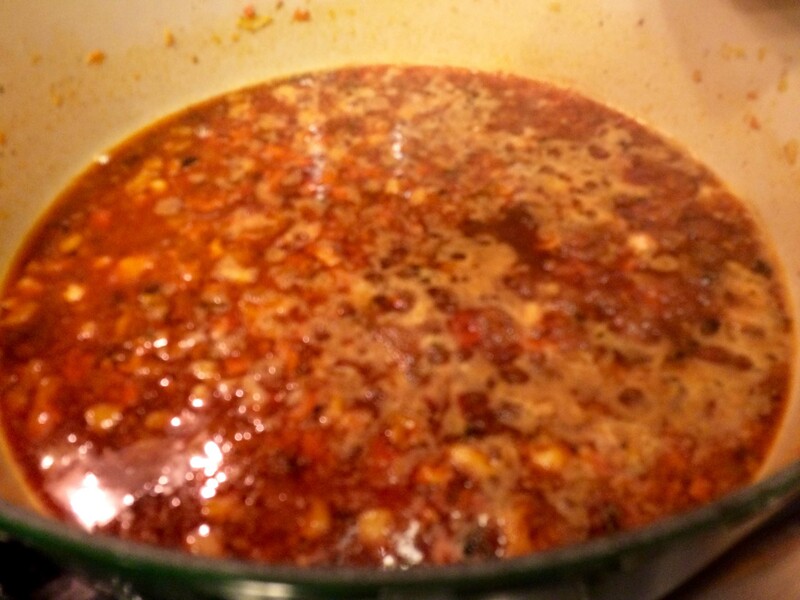 Replace the lid and simmer until the meat is extremely tender when prodded with a fork, about 2 hours. You can begin checking it after 1 hour. If all the liquid evaporates before the meat is tender, add a little water. When the meat is done the sauce should be thick enough to cling to a spoon. If it is too thin, remove the meat and raise the heat until it has reduced. 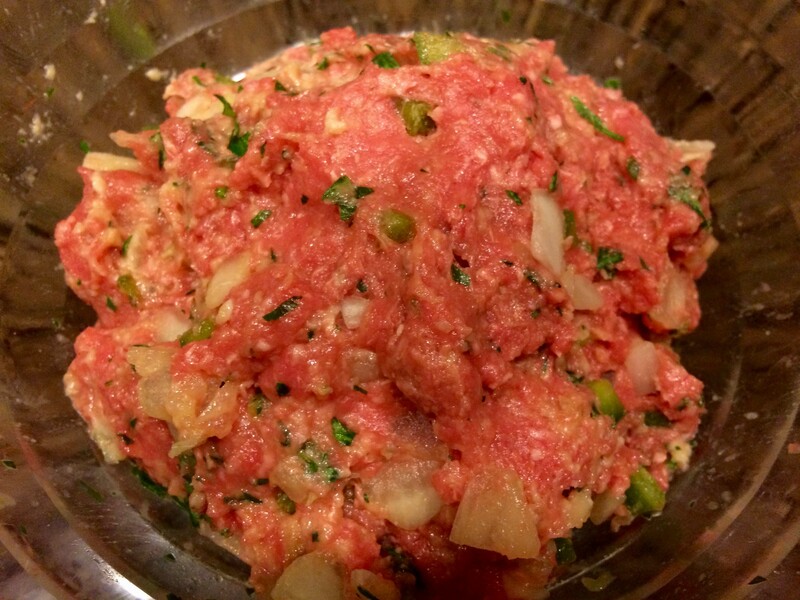 Slice the meat, return it to the pot to coat with the sauce, and serve. Note: This dish may be prepared up to 3 days ahead of time and reheated over gentle heat with a 2 tablespoons of water.